Here’s the full length submission I wrote for the Guardian – Keep It In The Ground campaign – in June 2015. Read the full piece by Damien Clarkson and Lilah Raptopoulos here. The feature was to inspire young people who may be interested in getting involved with environmental activism. The idea was to share (as a recently young person) to share advice with the next generation or people wanting to get involved in climate change campaigning. Whether your youth was marred by living under a flightpath or with the pollution of a nearby motorway; whether you saw your favourite forest ruined and turned into a shopping mall or whether you were dazzled by the TV news stories of eco-destruction – everyone has their own entry point into climate change campaigning. My youth was dominated by my grandparents stories of surviving the Nazi Holocaust which haunted my family ever since. The bittersweet outcome was that I had a huge inbuilt sense of tragedy and injustice. My family bookshelves were lined with books on comprehending such tragedy as the Holocaust. I picked up Hannah Arendt’s philosophies on ‘The Banality of Evil’ which highlighted how we all have agency to be part of problems in our world or part of the positive solution. To escape the horrors that laced my family home’s four walls I launched myself head first into the late 1990’s free party scene in London. As a young teenager I revelled in the fast beats, huge crowds and the thrill of taking over corporate space for public good. I read adverts on smokey toilet walls inviting the public to obstruct motorways to stop the pollution and ensuing social destruction and climate change to turn them into spaces of beauty, joy and community. I was hooked. Inbetween bunking off school to continue my adventures with free parties and Reclaim the Streets I sought solace in London’s remaining radical bookstores such as Freedom Bookshop. I chanced upon the amazing Arundhati Roy’s ‘The Greater Common Good’ who taught me how global systems of power and inequality are the root of this climate disaster and Rebecca Solnit’s ‘Hope in the Dark’ about how resistance to injustice, however hard, creates positive change. I soon found out about Plane Stupid, the direct action movement tackling the aviation industry – the fastest growing contributor to climate change. I was lucky to be involved in Plane Stupid for a few years, which is where I watched my friend and fellow campaigner Leo Murray’s climate change animation ‘Wake Up, Freak Out, Get A Grip’ – there was then no stopping me. 2) What activists and political figures do you look to for inspiration? I don’t. I have learned to look at myself and listen to those around me for inspiration. Young people, particularly in the Western world, are bombarded with thousands of daily pictures conditioning us into celebrity culture, consumerist fantasies and the hyper-individualist belief that we will only succeed if we look to the latest Pop Idol as the pinnacle of all greatness. As a young person we need to carve out time to understand who we are; what skills we have to contribute to society; what our strengths are; what we need to learn and, fundamentally, how we can step up to the challenges of our time in our own unique beautiful ways. 3) What are must-see films/documentaries/youtube videos for would-be environmentalists? For starters – David Attenborough’s nature documentaries (of course) which could move a dying snail into frenzied action. For main course I would recommend awe-inspiring examples of community struggles which have fought for environmental justice and won – such as the Coconut Revolution (Papua New Guinea) – and to reframe attention to current struggles there are films such as ‘Niyamgiri, You are Still Alive’ (India) and ‘The Village Under the Forest’ (Palestine). And finally for an easier watch – see Hollywood’s brushed story of hope against environmental exploitation –‘Erin Brockovich’ – the dinner is complete. Tuck in! 4) What is the funniest thing that has happened to you whilst campaigning? 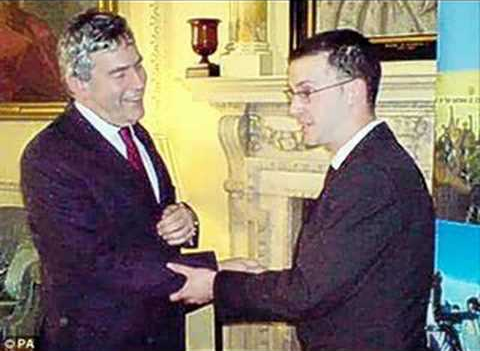 After supergluing myself to the then-Prime Minister (as you do) Gordon Brown I found myself still covered in attention-seeking glue. The plan was always to highlight the hypocrisy of receiving a campaigning award for working with communities to challenge airport runways – off the guy who wanted to expand them. Plan A was to superglue myself to Gordon and read a speech, Plan B (if for some reason he didn’t turn up) was to superglue myself to the iconic 10 Downing Street front door and, if I couldn’t get to it, to superglue myself to the Downing Street gates. I never expected to still be walking around 10 Downing Street post-action with nothing to do. During planning, we didn’t predict that Plan A would go smoothly, including the reading out of the speech written by residents under the flightpath and Gordon would prise my fingers off his arm and scamper away with no arrest – the sly devil! I was left to mince about 10 Downing Street with people offering me champagne saying ‘well done lad!’and ‘good on you!’ After checking in with my Plane Stupid crew that the video had gone to the press and was going live, I asked them what to do next through the two phones on Skype wired underneath my shirt. Hiding in the toilet trying to receive messages from them as they reported from a hotel room not so far away – I said ‘well I’ve done it, read the speech, stuck myself to the PM – but he just smiled and scampered away – what do I do now?’ ‘I know, well done. Great speech – it’s already in the Channel 4 news desk. And as for what to do – well, er, have you got any glue left?’ my friend said back. I reached through the hole in my trouser pocket and checked the small bags of glue attached to the outside of my boxers – ‘er yes’. ‘Well go get the door!’ By that time no one was watching and whilst I stuck the remains of the glue onto my hand and stuck myself to the door – the security guard looked at me strangely and said ‘er are you alright mate?’ ‘Er yes, well this is awkward’ I muttered. So, without knowing that the story would go viral, with one last attempt – I stuck myself with the dregs of the glue onto the gates and the security guard just looked at me and shook his head. Oh dear. Hilarious and embarrassing wrapped in one. The next day I visited my nan who was in hospital at the time, God bless her soul. She was sitting upright in bed with all the newspaper clippings on top of her, shouting and boasting to all the other old dears in hospital, in her shrill excited polish-yiddish accent ‘look at my grandson! What is your grandson doing? Look at my grandson! All over the papers! Oy vey!’ I walk in and she plants a huge kiss on my cheek ‘I’m so proud – you make me so proud! We are all so proud of you!’ Bless her, I couldn’t bare to tell her that, in her excitement she missed out the part of the superglue and thought I was in the papers just for winning the award! The moral of the story is, if we are committed to doing all we can to create a world of peace, environmental sustainably, justice and equality – we have to be taking action until we are 90 and beyond. Therefore, rarely, there are mistakes – it’s all part of the process. Laugh at yourself, learn and move on. That’s the best advice money can never buy. 5) What has climate change campaigning taught you? Honour sadness. If you aren’t sad, even utterly depressed, at the gut-wrenching environmental and social destruction going on all over Planet Earth, something is up. If you aren’t dazzled at the fact that 50% of the world’s beautiful biodiversity has been annihilated in the last forty years and that some humans think it’s a good idea to blow up sacred mountains to mine for minerals which get sent across the world to make phone apps run faster – I would be worried and recommend you seek help. Sadness is alchemical. It can move people to incredible, compassionate and daring acts for the greater common good. Don’t run away from sadness, hold it, listen to it and turn your grief into action. This world has been around for billions of years and will be for many more – we are a mere speck on it’s journey. Thousands of trees have been cut down, energy plants have polluted the sky and thousands of workers have been exploited for us to be having this conversation in this paper here today. Each one of us are so utterly insignificant. The planet doesn’t need a saviour. The world needs us to stop, listen, breathe, stand in awe at the vast unknown beauties in this global ecology and march onwards to protect it. 6) What are your hopes for the future of the climate change activism movement? The struggle against racism, homophobia, caste-ism, xenophobia, sexism, gentrification, capitalism and all forms of exploitation are all integrated with the struggle for climate justice. Climate change provides an opportunity to us to re-think how we exist and look after each other as long as we have the luxury to be on this planet. We need to integrate, organise and unite with all struggles for justice, on the same level, as one – not to simply exist – but to strategise and together win our struggles for justice.